Defeating curses that not only impact them personally, but also their co-workers and neighbors that they have unwittingly come to care about, can be a daunting task for many people. The process can become even more alarming when they reluctantly have to go against every instinct they’ve ever had, and start to change their actions, so that everyone’s destinies aren’t irrevocably changed forever. That important lesson is a notable and harrowing lesson that the title character of the acclaimed IFC horror-comedy series, ‘Stan Against Evil,’ is realizing throughout its current third season. Creator, executive producer and actor, Dana Gould, continues to make ‘Stan Against Evil’ relatable and humorous, despite its horror origins. The seemingly implausible circumstances that the title character and his fellow residents in his hometown of Willard’s Mill showcases how even the most improbable situations can ultimately emphasize realistic emotions. Actor John C. McGinley, who portrays the title character and also serves as a producer, gives a quirky and passionate portrayal of Stan. The character continues to showcase how an anti-hero, who has become the epitome of remaining stuck in the past and not wanting to care about anyone else, can ultimately impact the future of everyone in his life. The beginning of ‘Stan Against Evil’s third season picked up immediately after the events of the Season 2 finale, with Stan and Evie (Janet Varney) back in Willard’s Mill. The duo is dealing with the consequences of Stan traveling through time to save his dead wife, Claire. In doing so, he inadvertently opened a portal between the Land of the Living and the Land of the Dead, which allows evil forces to truly take over the town, and even some of its inhabitants. Although always the skeptic at first, Stan must work with Evie to once more save the town, even if it means making a literal deal with the devil. 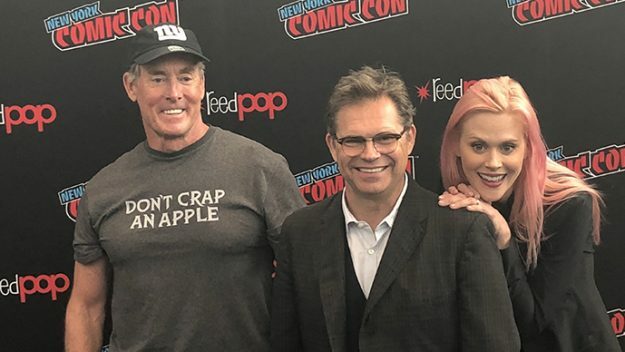 In honor of the final two episodes of ‘Stan Against Evil’s third season premiering tonight at 10 and 10:30pm on IFC, Shockya was generously given the opportunity last month to participate in interviews for the horror comedy’s current run during New York Comic Con 2018. Gould, McGinley and Varney all participated in individual press roundtable interviews, and discussed reuniting for an additional eight shows after the horror comedy’s first two seasons, which aired in the fall of 2016 and 2017, respectively. Shockya participated in the roundtables during the convention, after we were generously given the opportunity by the cable network to attend a set visit in Atlanta for the filming of the third season this past summer. The loss of Claire and his job “yields a profoundly dysfunctional guy” in Stan, McGinley then pointed. out “When he’s taking verbal shots at people, that’s born out of fear and loneliness. So when Season 2 ended, and Stan told Evie his truth, I was happy-I waited two seasons for that,” the actor further explained.